Note: This case study is in the process of being revised using an improved managed charging and discharging controller for PEVs to mitigate impacts on the Net Load curve. The results presented in the current version of the case study illustrate the methodology to examine PEV impacts on renewables integration, however the controller applied in this version was not an optimal controller. The net load curve is shown in Figure 1, and it is also commonly referred to as the "Duck Curve" because of its shape. The net load curve in Figure 1 points to two important challenges that California's grid will face as substantial levels of intermittent renewable generation are deployed. First, during the day time (i.e. 9 am to 5 pm) when there are many solar plants providing power to the grid there are likely to be over generation problems potentially requiring either renewable generation or base generation plants to ramp down their output. This is a challenge because it is very difficult for base generation to ramp up and down, and it is wasteful to not utilize the renewable power when it is available. Second, in the evening the time when demand is ramping up may coincide with the time when solar generation is ramping down. The resulting sharp upward ramp rate on the net load curve exceeds the ramp rate that can be supported by most generators, including peaker plants. These two challenges identified by the duck curve can be mitigated by deploying energy storage on the grid, which can be charged during the daytime over generation period and discharged during the sharp evening ramp period. California also has targets for the deployment of substantial amounts of grid storage, however this requires large amounts of capital investment. As more plug-in electric vehicles (PEVs) are deployed in California, the batteries in these vehicles have the potential to provide some of the grid storage necessary to alleviate the challenges identified in the duck curve. In this manner, PEVs can simultaneously advance two high level state goals in the adoption of clean transportation and the deployment of grid storage that can facilitate renewables deployment. This case study examines how PEV deployment can help or hurt the challenges identified by the duck curve. V2G-Sim simulations are run to quantify how PEV charging or discharging will impact the duck curve. As the duck curve does not include charging loads from PEVs, one scenario is run to quantify how the duck curve will change if PEVs are charged in an uncontrolled manner, where vehicles begin charging as soon as they are plugged in. A second scenario quantifies the impact of smart charging, where vehicle charging is controlled to favor charging during the over generation period and disfavored during the sharp evening ramp period. The smart charging period is referred to as "V1G", a term that is commonly being adopted in California to refer to smart charging of PEVs. 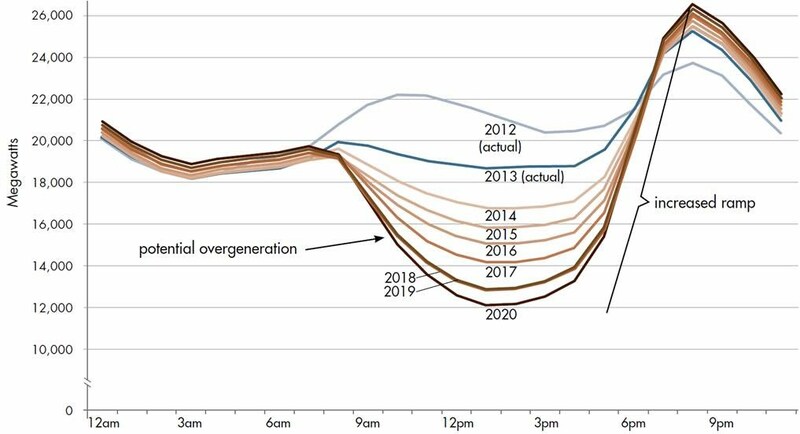 A third scenarios quantifies the impact on the duck curve if vehicles favor charging during the over generation period and are allowed to discharge to provide power to the grid during the evening ramp period. Each V2G-Sim simulation scenario includes almost 3 Million PEVs. The vast majority of these vehicles are plug-in hybrids that have specifications similar to a Chevrolet Volt. A smaller fraction of vehicles are pure EVs with specifications similar to a Nissan Leaf. Different scenarios are simulated with vehicles charging on L1 or L2 chargers in different locations. The simulation results from V2G-Sim are superimposed on top of the 2020 duck curve. V2G-Sim simulations are run for 12 cases, 4 sets of 3 simulations. The 3 simulations in each set are for uncontrolled charging, smart charging (V1G), and smart bi-directional charging (V2G). The 4 sets of simulations capture different cases of the type of charger that vehicles plug into in different locations. Figure 2 shows results where vehicles plug into L1 chargers at home and work, Figure 3 shows results for L1 chargers at home and L2 chargers at work, Figure 4 shows L2 at home and work, and Figure 5 shows L2 at home and L1 at home. Figure 2: Impact of PEVs on 2020 California net load curve with vehicles charging on L1 chargers at home and work. Figure 3: Impact of PEVs on 2020 California net load curve with vehicles charging on L1 chargers at home and L2 chargers at work. Figure 4: Impact of PEVs on 2020 California net load curve with vehicles charging on L2 chargers at home and work. Figure 3: Impact of PEVs on 2020 California net load curve with vehicles charging on L2 chargers at home and L1 chargers at work. The results in Figures 2-5 show how PEVs can support the deployment of intermittent renewable generation by mitigating challenges related over generation and sharp evening peaks. The results quantify how uncontrolled PEV charging will impact the duck curve by adding beneficial charging loads during the daytime over generation period and harmful charging loads during the sharp evening ramp period. In all cases smart charging (V1G) adds charging loads during the daytime over generation period and avoids adding charging loads during the evening ramp period. Smart bi-directional charging (V2G) mitigates both of the challenges of the duck curve, by adding charging loads during the daytime over generation period and by discharging during the evening ramp period. This case study demonstrates how V2G-Sim can be used to understand how PEVs can be used to support intermittent renewable generation. The case study focused on the California electricity grid, however similar analysis can be performed with V2G-Sim for other regions or for any other grid service.